In one of the most touching stories of the offseason, CEV has published in its official website the pilgrimage done by Belgian national teamer and A1’s Ravenna‘s Pieter Verhees with two of his brothers and a friend, Joris Vandael, in honor of the latter’s mother, who was recently diagnosed with cancer. The troop cycled for 7 days on the famous Compostela route, which cuts most of western Europe. “Unfortunately, it all started because the mother of Joris has cancer, and it has developed so much that a surgery would not help anymore at this stage. His grandfather died some years ago because of cancer as well, so Joris wanted to do something for a good cause. That is how it all started. 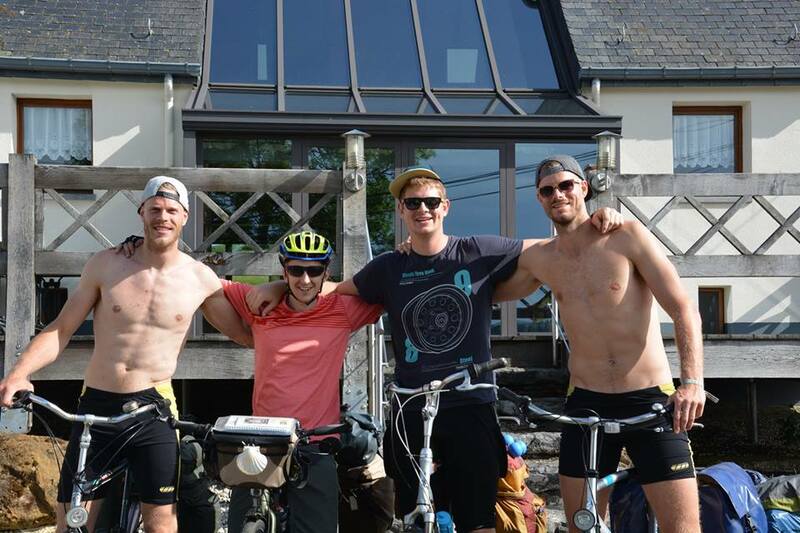 My brother Wouter is a good friend of him, and together with some other common friends, they decided to join Joris for the first week of his journey by bike to Santiago de Compostela, Spain. As soon as my other brother Hendrik and I heard about their plans, we decided quite spontaneously to join in as well and to spend some days together with Joris. We wanted to do so to support Joris and his mum, and to have some quality time together. I personally found this whole story very touching, but there is a connection with Volleyball as well, which somehow pushed me even more. His parents sometimes come to watch the matches of the Red Dragons, and they follow very closely our results and also the performances of my brother Wouter, who plays in the second division of the Belgian national league with Achel. Therefore, I did feel some kind of a connection with his family as well. His family has a house in Lommelsweiler, where we spent the second night of our common trip. The parents of Joris often go there at the weekend, and interestingly enough, Volleyball is extremely popular in this small town. When we stopped there to sleep after the second day of cycling, the whole town came together to drink something and the people were extremely happy so see some Volleyball players in the garden of their house. I think this get-together had a very good effect on the parents of Joris and I am especially happy with this – because this is the main goal of this whole action, to provide them with support and a sense of togetherness in these difficult times. They treated us very well; his mum and sister prepared dinner for us and we sat down with some 15 people, with many more joining us later on for some drinks. It was a very long, tiring day, because we had been cycling up and down across the Ardennes the whole day. Our journey continued for a few more days after that – it was me together with my brothers Wouter and Hendrik, and Joris, of course. We cycled through really beautiful places, surrounded by hills, nature, little towns, places you normally do not see if you are travelling by car. On top of this, we met a lot of friendly people who offered us drinks, chocolate, sweets, a ride to go to the next store, etc.,” the 205 cm tall, physically imposing, yet extremely warm-hearted Pieter recalls. “Half of the nights, we slept in a tent, but sometimes we realised that it was getting really cloudy in the evening, so we decided to take a room at a hotel because we did not want to get wet. We cycled for some 85 km a day, which is quite demanding, but at the same time it was a good exercise to keep in shape.